Today’s skillet was inspired by a Cobb Salad. Although it is not traditional to use kale (and certainly not cabbage) I almost always substitute kale for lettuce when making salads. I love all of these flavors together, though if you aren’t used to cooked cabbage, perhaps leave it out, for now. 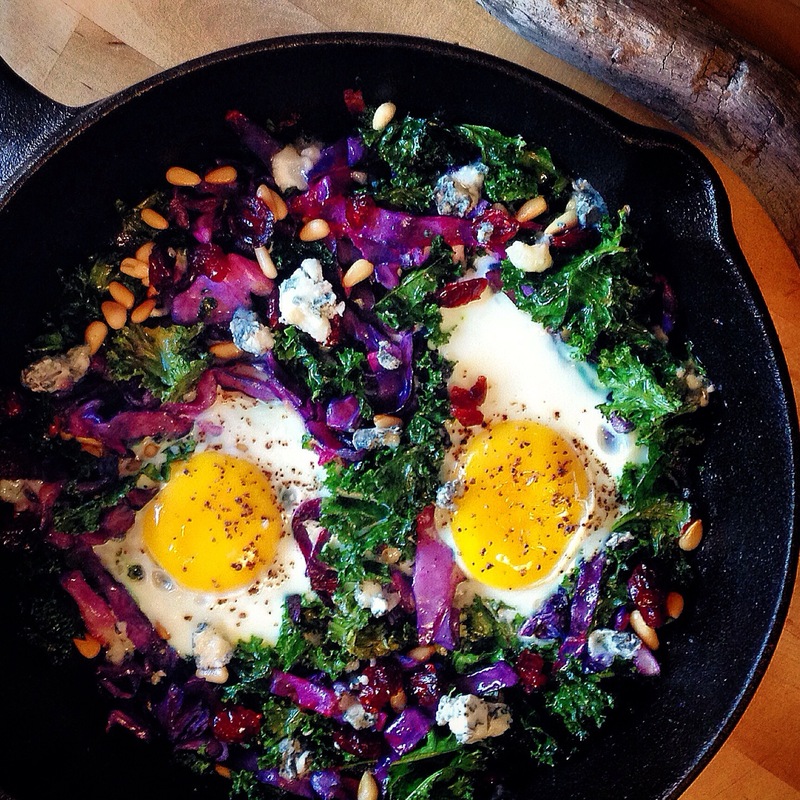 I do find this skillet, despite all of the bold flavors, to be quite balanced, though certainly flavorful. It has a wide range of textures, colors and nutrients. 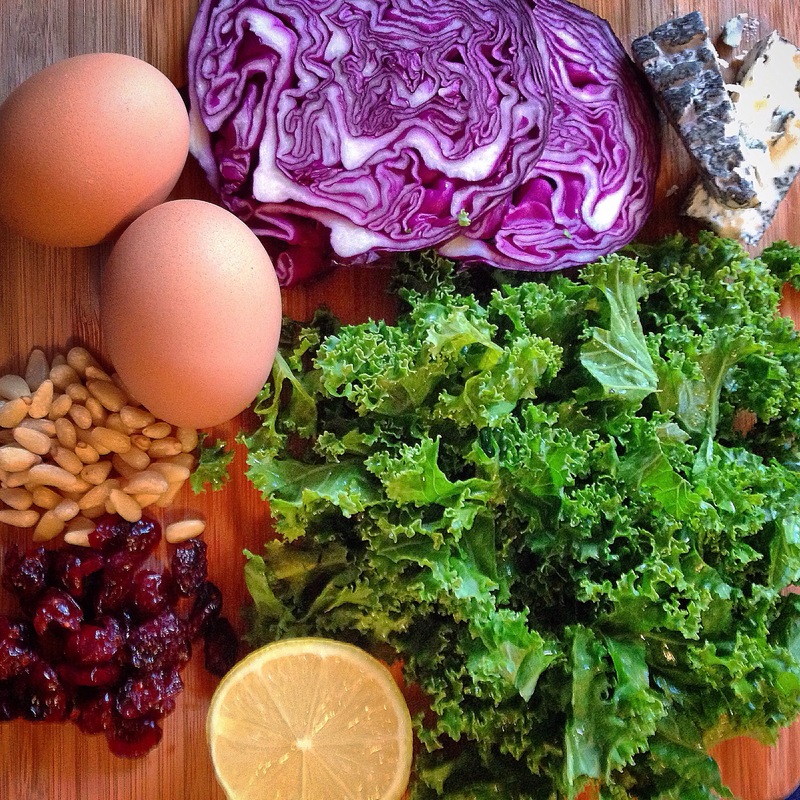 Blue cheese and cranberries are one of my favorite pairs and the cooked cabbage and kale can be a bit easier to digest than raw. Its very easy to make! Cut your cabbage and kale into varied strips/pieces. Heat cast-iron skillet over medium-low heat. Once warm add pine nuts and lightly toast for about two or three minutes, shaking the skillet about every 20 seconds. Remove nuts from pan. Heat coconut oil over medium-low heat. Add cabbage to the skillet and saute for a minute, stirring the whole time. Add the kale and saute for another minute, always stirring. Sprinkle with salt & pepper and stir again. Remove from heat and sprinkle on the pine nuts. Dig little wholes for the eggs and gently crack them into the holes. Put the skillet in the oven for about 8 minutes or until the whites are cooked, while the yolk is still a bit runny. Remove from heat, sprinkle on blue cheese and cranberries and spritz everything with fresh lemon juice.